In two weeks, free light weight single-use plastic bags will be disappearing from the major supermarkets, Big W, Dan Murphy's, Bakers Delight and many more locations across the country. Queensland and Western Australia will be catching up with Tasmania, South Australia and Northern Territory when their State wide bans of single-use plastic bags come into effect at the same time too. Victoria is tipped to announce a state wide ban soon and New South Wales is unfortunately not doing anything. I'm not here to dwell on those left behind – instead I'm here to share tips that will help you get ready for life without those free single-use plastic bags. From 1st July shoppers will no longer be able to bag (and some cases double bag) their items in a flimsy plastic bag. This is not a complete plastic bag ban, only the free light weight single-use ones. Shoppers will have the option to purchase a thicker plastic bag for 15c. Certain businesses won't be providing alternatives. Thicker plastic bags still pose a threat to the environment. Nothing has changed there. Saying no to the thicker bags, even if it's sold as being reusable because of durability, is the kinder choice for the oceans and local environment. Plus those thicker plastic bags will eventually be banned too. Plastic Bag Free Victoria and countless other environmental action groups are still asking for a complete ban. It's inevitable so you might as well get into the habit of bringing your own bags now. Using plastic to collect our shopping is a waste of resources plus it promotes the use of fossil fuels like petroleum. Yes, they can be recycled. Well technically down-cycled into once more item then it's the end of that resources life for now. Instead let's use this plastic bag ban to save our millions old resources for something other than a bag. The new thicker plastic bags are even uglier than the light weight ones. It's true. Do you really need to carry your avocados and loaf of bread out of the store in one. I didn't think so. Human beings survived for a long time without plastic bags. We had cloth bags, baskets, wicker trolleys, our arms, horse and carts, cardboard boxes. There are an array of different tools you can use to carry your food home without the need for a plastic bag. Alternatively, perhaps you could make your own from an old duvet cover, sheets, pillow cases, tablecloth, curtains or join a Boomerang Bags group in your area. Read my interview with the founder of Boomerang Bags here. 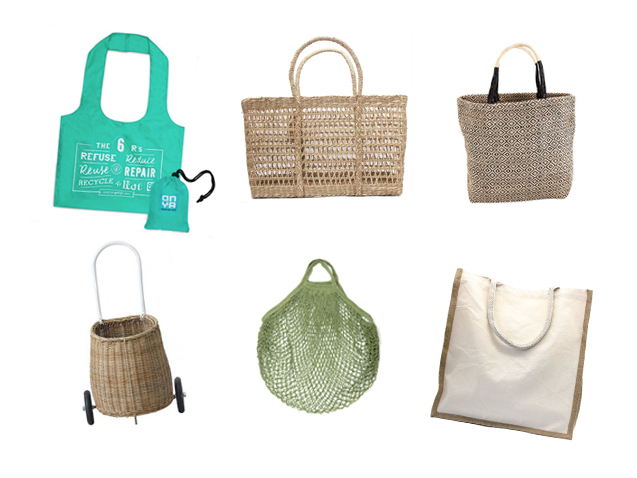 Shopping bags made of jute, canvas or cotton string are simple alternatives to plastic. When they become dirty it's easy to place the bags into your washing machine. To make jute, canvas, cloth or string bags a more environmental choice use them for as long as possible and repair any holes that might eventually occur with wear. Then when the bag comes to the end of its life, they can become a cleaning rag before going to the compost bin where they will break down. Plastic will only break up getting into our food chain and risk ingestion or strangulation of animals. Foldable bags made of recycled plastic like this option by Onya can fit easily into any handbag or pocket. You can even hang them off your car keys and pull them out of their little pouch as you need one. If you feel the need to wash I suggest to hand wash with a mild soap to reduce any plastic micro-fibres from getting into our water ways. I love these rectangle seagrass or round seagrass as a sturdy alternative. A wicker shopping cart would also be a handy way to shop without the need for a plastic bag. If you can, try to avoid buying the green 'fabric' bags at certain stores. The fabric is made of plastic. But if you have them at home use them! 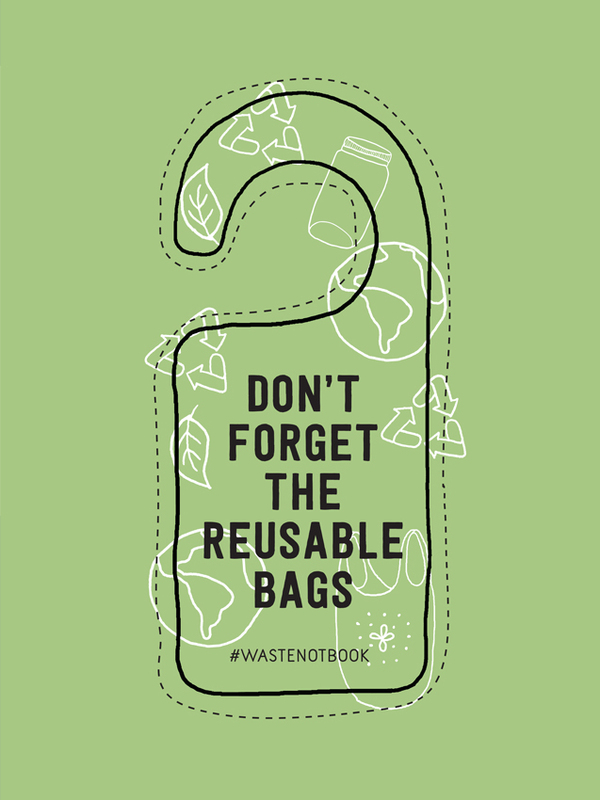 At the end of the day choose a bag you'll use and reuse. At the supermarkets and caught without? Ask for cardboard boxes or load everything back into your trolley then wheel back to the car. If you were stuck doing this more than once I reckon you'd remember your bags quickly! Buying a reusable bag or basket is the easy part. Remembering to use it will be the trick to saving that 15c for your smashed avocado. Read the tricks I used to change my plastic habits. Put reminders into your phone. Stick visual reminders around the house, on the back of the door or from your rear view car mirror. Download the image below, cut out and use. Choose a home for you bags and return your bags to this location each time. This will help save time locating them if you are in a rush. If you have children give them the role of plastic bag police. It's their job to make sure the reusable bags are packed and used. They can issue fines if the parents are caught without. Buddy up with your partner, friend, housemate to help each other remember. It's going to take some practice to remember plastic bags are banned or no longer given away for free anymore when going to the shops. But you are not in this alone. There are millions of Australians who will be in the same position. Let's help each other and reward our efforts to break our plastic habits. The future generations will thank you for making the choice to preserve the earths resources for something more valuable than a plastic bag. Breaking habits that are ingrained in our life can be hard but not impossible. We all have habits and they are aren't all bad. Many of us have good ones. And soon enough carrying reusable bags will be a new normal habit before you know it. But, what about lining my bin? While you are ordering your brunch on the weekend, ask your local Cafe for any surplus newspapers from the day before and use the newspaper to line your bin instead. Your local library is another option to seek out extra newspapers. Do you think charging for plastic bags will stop people from using them? Yes, I do. We can take a quick look at the UK where there was a 85% drop in plastic bag use when they began charging for light weight single-use bags. Sure there wasn't a 100% avoidance by everyone but there was a drop and that is a step in the right direction. We will get to a point where we'll look back and cringe at how many plastic bags we used to use. What about biodegradable or compostable bags? Choosing biodegradable plastic bags do nothing to promote reuse which will always be a more environmentally friendly choice. A biodegradable bag can still harm and injure wildlife. A biodegradable bag made of a plant source (think corn) won't break down in landfill properly because there is no oxygen. They can't be recycled. Most Australian composting facilities don't take them. And it's rare Aussies home composts are set up to a temperature that would break them down. Even when it does break down or actually break up (it turns into small pieces first that move about the environment faster) there is a residue left behind. There is not enough information yet to determine if these residues are safe. Then there is the risk biodegradable bags are sold without being properly tested or are actually degradable bags but sold with the word 'bio' to lure customers in. Degradable bags are different to that of biodegradable and compostable. It's a confusing grey area. I see biodegradable and compostable bags as slightly better but are again another bandaid solution and with all the other options above, not necessary at all.